Ryan Anderson. Photo c/o R. Anderson. A small, Ottawa based start-up may have put together a consortium of thirty-nine Canadian space focused corporations, associations and academic institutions willing to contribute time, effort and up to $328Mln CDN, to apply for Federal matching funds under the Justin Trudeau government's new $950Mln CDN Innovation Superclusters Initiative. 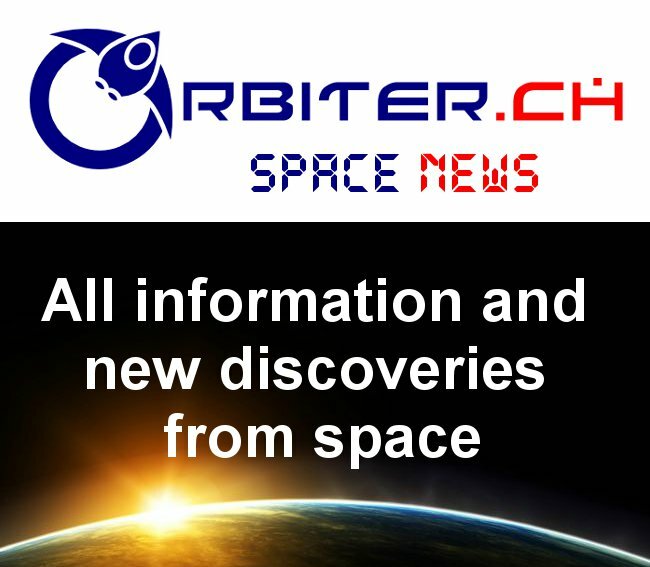 But according to Ryan Anderson, the lead organizer for Satellite Canada, the start-up which built the consortium, the real test of his plan to jump-start the domestic satellite industry will come sometime before the end of 2018, when the initial government vetting is completed. According to Anderson, "if we're invited back we have to submit a Phase 2 application that requires greater detail and more substantial commitment. Whether Satellite Canada is invited to Phase 2 alone, in conjunction with another cluster, or not at all, we still have to work or the details of how our cluster will work." "My understanding is that two hundred applications had been received by Innovation, Science and Economic Development Canada (ISED) when the applications process closed," said Anderson during a recent interview, "so the competition is pretty fierce." According to Anderson, Ottawa, ON based Telesat (where he used to work) and Richmond, BC based MacDonald Dettwiler (MDA) have both committed to contributing substantial matching funds for the project, along with a substantial contribution from an unnamed "fintech affiliated company." Letters of support have been received from a variety of organizations, include Cambridge, ON based Honeywell Canada (once better known as COM DEV International); Mississauga, ON based Magellan Aerospace and several academic institutions including Waterloo University, Carleton University and the University of Ottawa. Graphic showing the scale of the Satellite Canada proposal and the number of industry verticals it overlaps. Graphic c/o Satellite Canada. Other organizations such as the Canadian Satellite Design Challenge (CSDC) and the Canadian Space Commerce Association (CSCA) have also provided letters of support, as have several government organizations, including Natural Resources Canada (NRCan) and Agriculture and Agrifood Canada (AAFC). "One third of the organizations are interested and committed but have provided no financial support. Eight of the organizations are not for profits and the remainder come from a variety of areas," said Anderson. 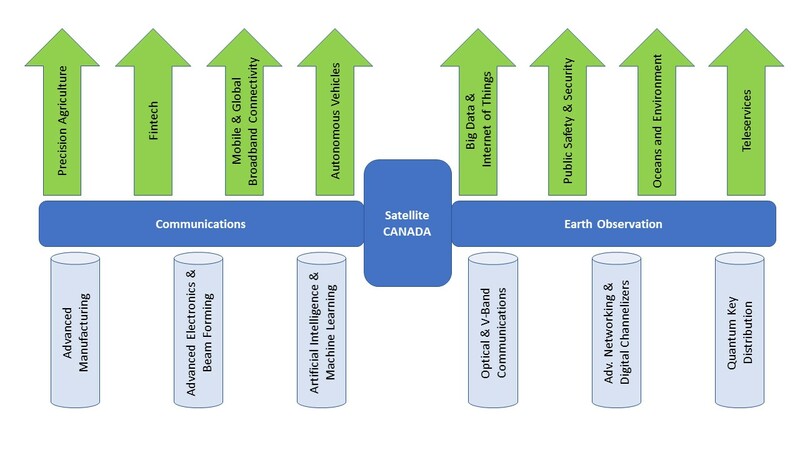 Satellite Canada has based its proposed operational model on on two United Kingdom based facilities, the Harwell Science and Innovation Campus and the UK Satellite Applications Catapult. Of course, the current round of this process is designed simply to establish whether or not the applicants know what they're doing. "It's the speed dating round," according to Anderson, and the Satellite Canada application hasn't even got that far right yet. But no one else has either. As outlined in the July 24th, 2017 update to the Federal Government Innovation Superclusters Initiative website Frequently Asked Questions page, "contributions to superclusters are normally expected to be in the order of $125-250Mln CDN, with funds matched by industry; however, specific amounts and number of contributions will depend on the nature and scale of the applications received." Only 25% of the contributions are allowed to be in-kind although ISED has chosen to define salaries of company employees working on cluster projects as cash contributions. "I don't know how many applications will get to phase two of the process, but I think we're well positioned as serious contender," Anderson feels. Here's wishing him luck. The space industry in Canada could use a good kick in the pants.